Requirements were REVISED effective in May, 2014, and become officially effective on January 1, 2015. 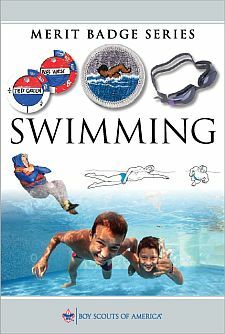 Explain to your counselor how Scouting’s Safe Swim Defense plan anticipates, helps prevent and mitigate, and provides responses to likely hazards you may encounter during swimming activities. Discuss the prevention and treatment of health concerns that could occur while swimming, including hypothermia, dehydration, sunburn, heat exhaustion, heatstroke, muscle cramps, hyperventilation, spinal injury, stings and bites, and cuts and scrapes. With a helper and a practice victim, show a line rescue both as tender and as rescuer. The practice victim should be approximately 30 feet from shore in deep water. Float face up in a resting position for at least one minute. While wearing a properly fitted U.S. Coast Guard–approved life jacket, demonstrate the HELP and huddle positions. Explain their purposes. Use the feet first method of surface diving and bring an object up from the bottom. * If your state, city, or local community requires a water depth greater than 7 feet, it is important to abide by that mandate. Swimming. Demonstrations or activities in or on the water must be conducted according to BSA Safe Swim Defense and BSA Safety Afloat.